I was so surprised at how eagerly all three of my boys jumped at the chance to work with clay last week. I bought a box of Sculpey clay a few months ago (specifically for this 100 Days of Art Challenge) and had forgotten about it. I do not enjoy working with clay but I was so pleased to find that all three boys loved it. So much so that we're almost out of clay and they've asked me to buy another box. The hardest part of this art assignment was helping them each decide on what they were going to make. While they thought about what they wanted to do they worked with the clay to get it warm, soft, and malleable. Alec made a clay owl following the instructions found on 4 Crazy Kings here. Evan made a large pendant/ornament that is a replica of the Overwatch symbol. Ian decided to make a coil mug/pot to hold pens and pencils. He used a soup can as a general guide for the size and ended up smoothing most of the coils out when he was finished. We baked their projects in the oven following the instructions on the box and the younger two boys added paint and glaze afterwards. Clay is such a great project. 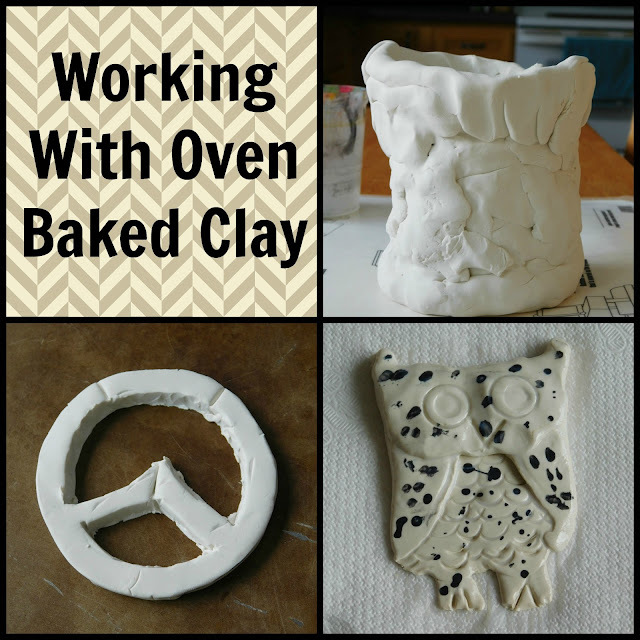 They get both the tactile exercise of working with the clay plus the creative expression.